The Supreme Court of the Gambia will rule today on whether the National Assembly would be restrained or not from swearing the newly nominated member of the National Assembly (NA), Mr. Foday Gassama. The Coram of the court is Honourable Justices of the Supreme Court; Hassan B. Jallow (Chief Justice), R.C. Sock, Gibriel Samega Janneh, Cherno Sulayman Jallow (QC) and M.M. Sey. The court will today rule on two cases, namely the case between Ya Kumba Jaiteh versus the Clerk of the NA, the Speaker of the NA and the Attorney General and the other case is between Lawyers Lamin K. Mboge and Ibrahim Jallow versus the Attorney General and 31 National Assembly Members (NAMs). Both cases relate to the sacking of Hon Ya Kumba Jaiteh member of the National Assembly whose nomination was revoked by President Adama Barrow. Meanwhile, the court has struck out the names of the names of the 31 NAMs as defendants in the case of Lawyers Mboge and Jallow v the Attorney General and 31 NAMs although it has maintained that Ya Kumba Jaiteh will remain as a defendant. The case between Ya Kumba Jaiteh against the Clerk of the NA and two others, the plaintiff (Ya Kumba Jaiteh) is seeking declaration that President Adama Barrow lacks the power to revoke her nomination. She wants the Supreme Court to declare the action of President Barrow to revoke her nomination as unconstitutional. When the case was called before Chief Justice, Hassan Jallow and his panel of judges, Lawyer Borry Touray, Lawyer Lamin Darboe and Lawyer Aziz Bensuda represented the appellant (Ya Kumba Jaiteh), whilst Binga D. appeared on behalf of the State. In his submission, Lawyer Bory S. Touray for Ya Kumba Jaiteh told the court that the action of the president to revoke the nomination Jaiteh was unconstitutional. 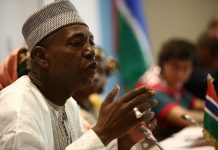 “By virtue of section 91 of the constitution of The Republic of The Gambia from which the powers to confer the nomination of Yakumba, we are humbly submitting that the president has no powers to rescind the nomination of a National Assembly Member,” said Barrister Borry B.S Touray Lead Counsel for Yakumba Jaiteh. He also prayed for the court to bar Foday Gassama replacement for Yakumba Jaiteh from assuming the office of the National Assembly, arguing that if Gassama assume is not bar from assuming office it may cause controversy because Yakumba hasn’t accept her dismissal as a national assembly member and such situations will see two people holding one seat at the house. 1. A declaration that the seat of a member of the National Assembly may only be vacated pursuant to Section 91 (1) and not in any other circumstance. 2. A declaration that no person or authority other than the Supreme Court of the Gambia is competent to determine the question of whether or not the Plaintiff’s seat or any other member’s seat in the National Assembly has become vacant. 3. A declaration that the purported termination of the Plaintiff’s membership of the National Assembly through an Executive decision communicated to the Plaintiff by letter referenced PR/C/66/Vol4/(66-EOC) and dated 25th February 2019 is null and void and of no effect. 4. A declaration that the Plaintiff is a member of the National Assembly her seat not having been vacated through an event of disqualification. 5. An order directing the Defendants and any other person or authority of whatever description not to interfere, impede or obstruct the Plaintiff in the performance of her constitutional functions a member of the National Assembly until she ceases to be a member by virtue of Section 91 of the Constitution of the Republic of the Gambia. 6. A declaration of the purported nomination of the 3rd Defendant as a nominated member of the National Assembly is null and void and of no effect. 7. An order restraining the 2nd Defendant (the Speaker of the National Assembly) from administering the prescribed oath under section 88 (2) onto the 3 Defendant (Mr. Foday Gassama). 8. An order restraining the 1st Defendant and the 2nd Defendant (the Clerk and the Speaker respectively) from attempting in any manner to bestow upon the 3rd Defendant (Mr. Gassama) any right, privilege or role as member of the National Assembly. 9. An order restraining the 3rd Defendant from parading himself as a member of the National Assembly in any manner or form. Yakumba Jaiteh is challenging the rescindment of her appointment as a nominated member of the National Assembly by the president of the country Adams Barrow. On their objection to the plaintiff’s case, Lawyer Binga D. who appeared on behalf of the Attorney General said the president has the right to rescind the appointment of any nominated member of the house. “Nominated members has a limited right under the circumstances of the law and the president has all rights to rescind the appointment of any nominated member,” state prosecutor Binga D. adduced before the court. He argued that if the Supreme Court grants the declarations the Plaintiff sought it will put the State in a difficult situation and will derail the overall processes of the National Assembly. He submitted that a nominated national assembly members have privileges and those privileges should not be considered as rights. The court will rule on this case as to whether it will grant what the plaintiff sought or not. On the other case, where two lawyers brought a civil suit against the Attorney General and 31 NAMS, Lawyer Lamin K. Mboge told the court that the action before the court is seeking declaration for the court to enforce the 1997 Constitution; that the President has the power to revoke the nomination of a nominated NAM. The Supreme Court has partially upheld the objection made by Lawyer Azziz Bensouda for the defendants by striking out their names as defendants. However, the court indicated that the action brought by the two lawyers is legitimate and the court has the jurisdiction to interpret and enforce the provisions of the Constitution of the Gambia. Bensouda, in his submission argued that the plaintiffs (the two lawyer) do not have the locus standi (legal standing or power) to bring an action against the NAMs. He further argued that the action of the lawyers was frivolous and pleaded for the court to award substantial cost in favour of each of the NAMs. The court in its yesterday ruling did not award any cost in favour of the defendants. Lawyer Mboge told the court to take an action on the threat by Ya Kumba Jaiteh that she will continue as a nominated NAM. “I shall therefore, continue as a nominated member of the National Assembly until 2022 when my nomination shall expire,” Mboge quoted from the letter that Jaiteh sent to the President. He argued that section 88 of the Constitution gives the president the power to nominate 5 members of the NA. “Two members cannot occupy one seat in the National Assembly; that is why we brought the matter to the court for redress,” Mboge told the court. He put forward that the NA’s Monday on the 18th March 2019 schedule is the swearing ceremony of the newly nominated member of the NA. “We are seeking this court to act in accordance with provisions of the Constitution to determine our application before the 18th March 2019,” he said. He argued that Ya Kumba Jaiteh became a member of the National Assembly through the president acting on the powers conferred on him in the Constitution. Today the court will rule on the exparte motion seeking for an injunction to restrain Ya Kumba Jaiteh from assuming office pending the determination of the case. 1) A declaration that the President has the power to revoke the nomination of Ya Kumba Jaiteh relying 1997 Constitution of the Republic of The Gambia, particularly sections 76 (1) and (2), 91 (1) (b) and 231 (1) and (5). 2) A declaration that the revocation by the president of the Republic of the Gambia of the nomination of the 2ndDefendant as a member of the National Assembly. 3) A declaration that the purported resolution of the National Assembly signed by the 2nd to 32nd defendants signed by the 2nd to 32nd defendants on Monday the 25th February 2019, is procedurally defective, illegal, unconstitutional, fraudulent and therefore impermissible and contrary to public policy. 4) A perpetual injunction restraining Ya Kumba Jaiteh from occupying the office as a member of the National Assembly on the ground that her nomination as a NAM is revoked by the President who nominated her into that office.